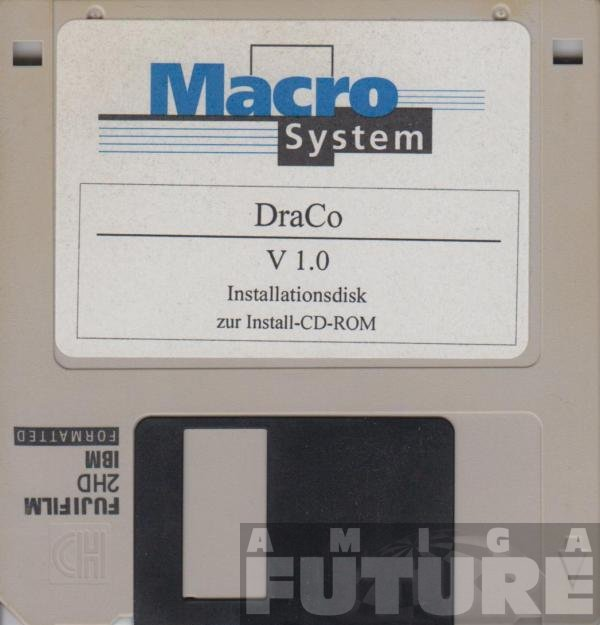 DraCo is an officially licensed AmigaOS 3.1 CD-ROM designed for the MacroSystem DraCo. A complete Art Department Professional installation that, among its bonus features, includes the popular morphing program Morph Plus. Also included are a small set of custom-made commands and programs to tweak AmigaOS usage for DraCo use, and even sports its own special version of the SetPatch command called "DraCoSetpatch". DraCo is bootable, and despite the confusing labeling system on the Kickstarts that the DraCo contains, uses either two or even one ROM-based v40.68 A3000 Kickstart. DraCos could properly address more than 4GB of hard disk drive space if one of their internal custom ROMs was properly upgraded, either by replacing a chip or by soft-kicking it, unlike default AmigaOS 3.1 systems.